Question...In the quad comparator docs the threshold pots are tied to +V and ground. Shouldn't that be +V and -V? At least, that seems to be how other designs I've seen for synth use are built. As you can see, I chose to normal the threshold pots to jacks, so that I can experiment with external threshold references. I think it will yield some interesting results. Love the module so far, I've needed/wanted this functionality for a while. 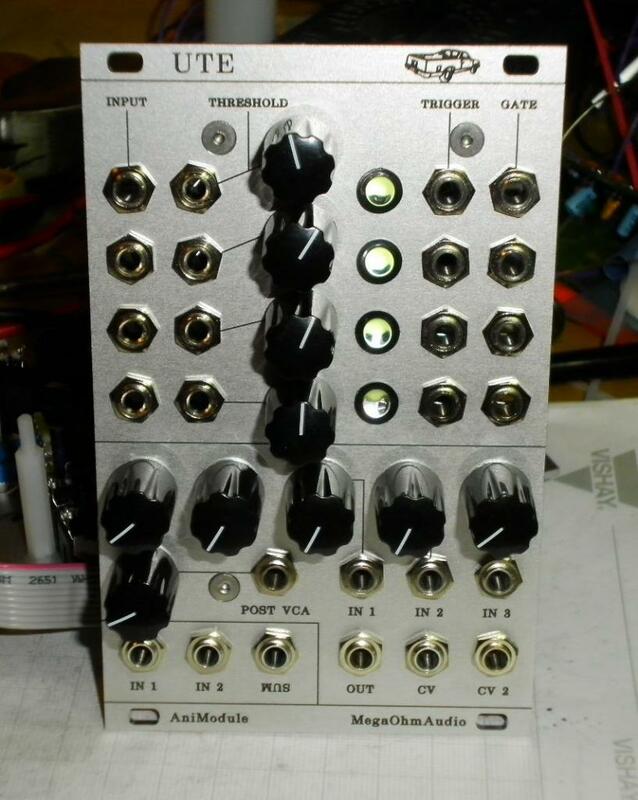 Is the VCA Rider connected to the Quad COmparator? Or is it a two for one module? I always wonder what happens to them when I send a DIY PCB out. Yes, I connect threshold to +/- V.
When I posted write-up on it I hadn't tried it yet. I love the normalled jacks too! The circuits are completely separate, but the power comes through the VCA rider PCB, because it has the polyfuses on it. It's my only reverse-polarity protected module at the moment, so I almost want to plug it in backwards to justify buying the little PTC fuses! My idea is to do a few modules packed with what I consider to be utility circuits. I'm also doing a very similar panel with a logicogic and vca rider sharing a panel. That way I didn't have to change the bottom part of the panel. I think a fully pimped out comparator module would be useful to a few people, maybe you could do a limited edition version. I wish I had included your new little pixel demon dude on my panels. If you plug the QC in backwards you'll get smoke. It's as easy as swapping out the fried ICs to fix it though. I'd be happy to send you a jpg or gif or whatever if you like. Are still doing all of the panel and pcb engraving yourself? If you can etch aluminum you can etch a pcb. The copper clad boards don't boil and spit near as much as the aluminum. Etching a PCB is tame compared to that. I cut my Panels and my PCBs on my little CNC mill. Then I Screen Print the panels. The LM-VCO is my first Double-Sided PCB. I'm using electrolytic etching with copper sulfate, salt and water. I would have to mix up a different etch to do PCBs, and I don't have those chemicals yet (ferric chloride and citric acid). I also just installed kicad, with the intention of being able to lay out pcbs and have them made for me. Thanks for checking out my blog. I really need to update it more often! The octopus is purple now.That was my first practice run, but it was also done with the goal of having something my wife wouldn't mind hanging on the wall. I have a question on the LogicOgic. Does it need a 100uf capacitor? I don't see a spot for it. I usually end up using a 10 uF cap. It's just a smoothing cap for the Power. It would go right above the power connector. Ok, I just wanted to make sure it wasn't something you added after the fact because it was needed. Here is my LogicOgic/VCA combo. Like the last one, there is no interconnection between the two PCBs except for power. I really like the layout on that. Are those countersunk flat head screws? They are countersunk hex screws. I get them at McMaster-Carr. This module has 4-40 and the module next to it has 3mm. I used to only use 3mm hardware, but I wanted to try using hinged standoffs, which I can't find in 3mm. I like the truck and the plane. 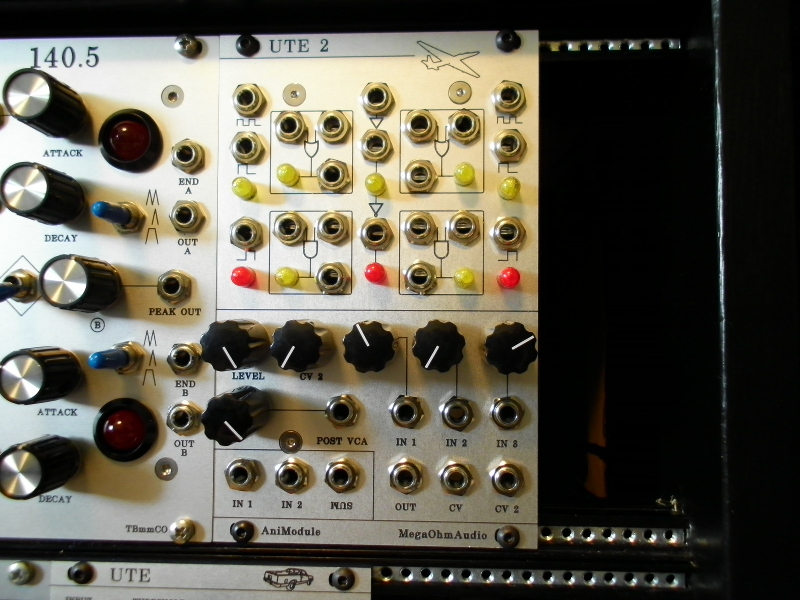 Ute was the name of the front panel file for the first one and it just sort of made its way onto the panel itself. Ute is also what Aussies call el caminos and other half-pickup-half-cars , so I put one on the panel. The plane on the second panel is a U2 spy plane, so that is just a really bad pun. I do have itchy feet though...have you noticed where I live? I just looked it up. Seems like you got some good things going on there. "For every 100 females there were 90.4 males. For every 100 females age 18 and over, there were 85.8 males." "Thief River Falls is home to the electronic parts distributor Digi-Key, one of the largest employers in the area, "
I just found a problem in the LogicOgic docs...the AND and OR labels are switched. I noticed it after the first one I built, but I figured the mistake was mine and fixed it without really looking into it. When I had the same problem again, I looked closer and found the docs to be wrong. The M/F ratio is pretty nice, but I brought my wife with me, so that does nothing for me. 2nd fact is why we live here in the first place, and yes, the employee discount is quite nice. I will miss it when I start my own business. I'm pretty sure it's as simple as swapping the ICs though. They have the same input/output architecture as well. I just swap the ICs. Or if you find you need more OR gates or AND gates just double up. I didn't socket them, but switching the wires around was almost as easy. Unfortunately I've never reworked this for euro and the board is fairly enormous.